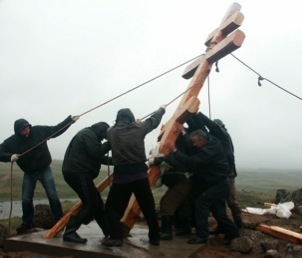 „Little Wallis“ in the russian tundra. b) the approaching helicopter for the pickup…. 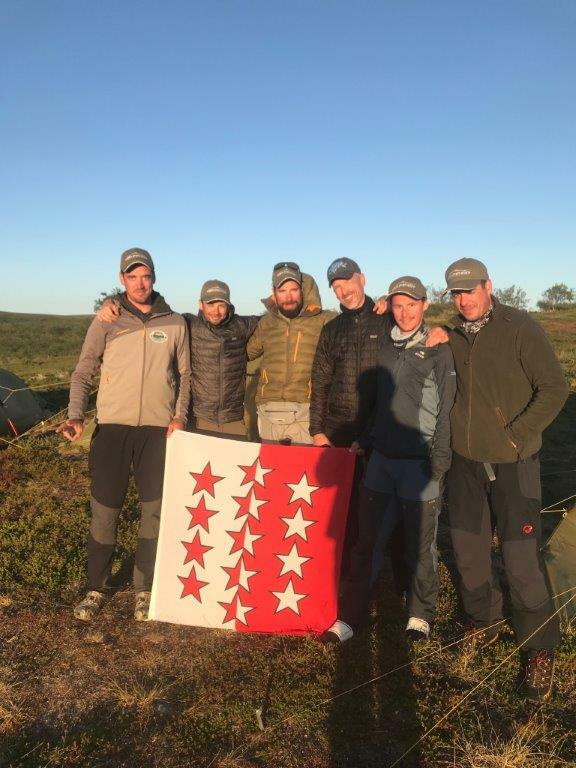 But on August 2018, 1st this was the sign for Benjamin, Joel, Kevin, Robin and Sascha (5 highly motivated swiss tundra-greenhorns) and me, their groupleader Christoph to celebrate the national celebration day of swiss confederation at 1291 in front of our tent camp at Oset Kharlovka, where we spent a whole week without midweek change because of the low water conditions of the Litza. Group A (left to right: Joel, Robin, Benjamin, Christoph, Sascha, Kevin) with Wallis flag. 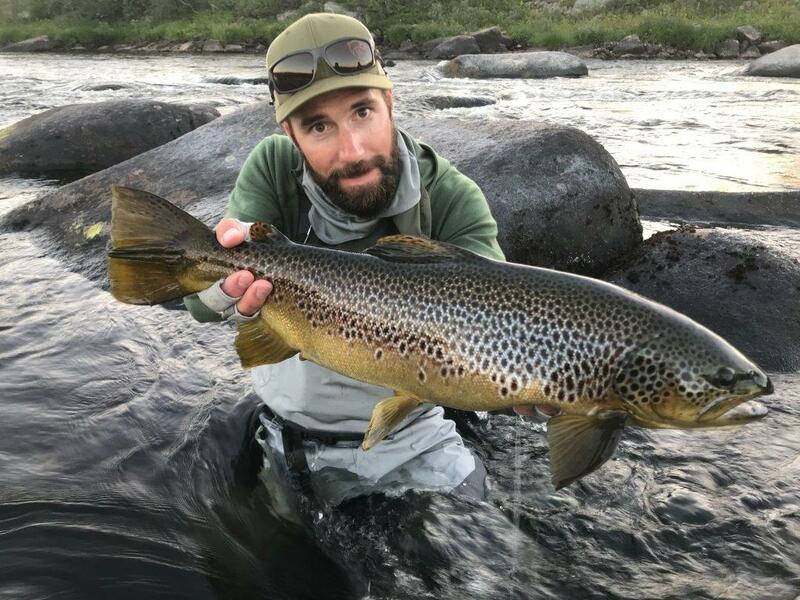 Benjamin with Browntrout (BT) 3kg. 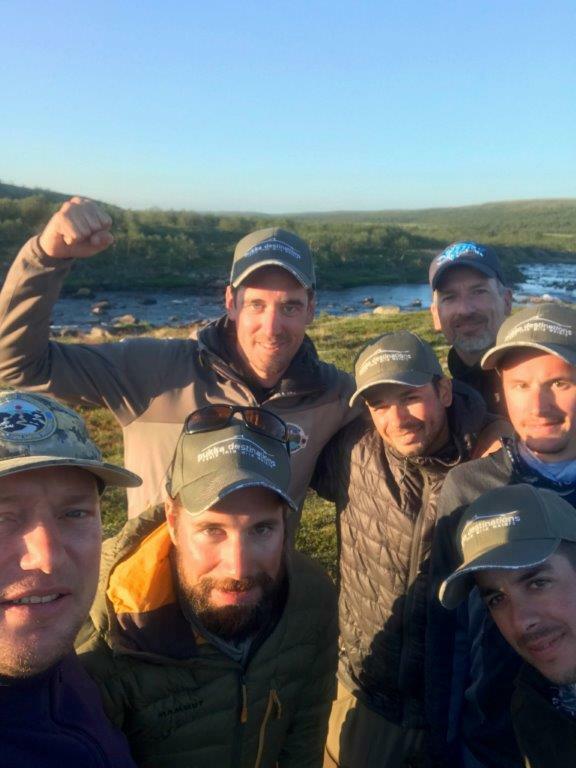 Noteworthy the extreme weather conditions weren`t able to discourage our avid group despite lacking any hatches or constantly rising trouts and despite the irregular fishing conditions (p.e. more or less no active fish in the famous pool-tails at Oset, water temperature up to 23 °C). 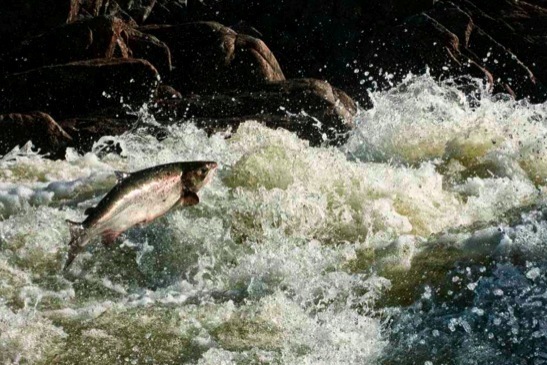 Probably the early run of salmons changed the game too. 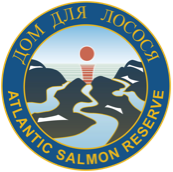 It took us steady efforts to locate the trout in the pockets of rapid water between the big pools, where the salmon were rolling at the surface. 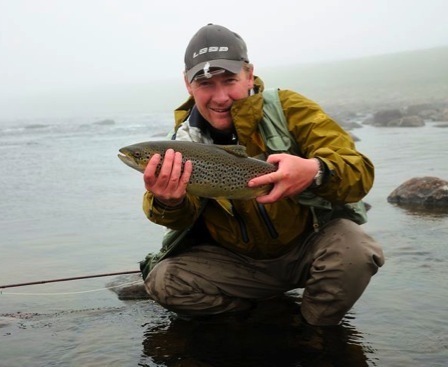 Only at Dream Kharlovka, whose famous big fish hotspots we visited every second day of the week to spread out the fishing pressure, the well shaped browntrout-beauties were aligned along the V`s and pool tails in a classical manner. 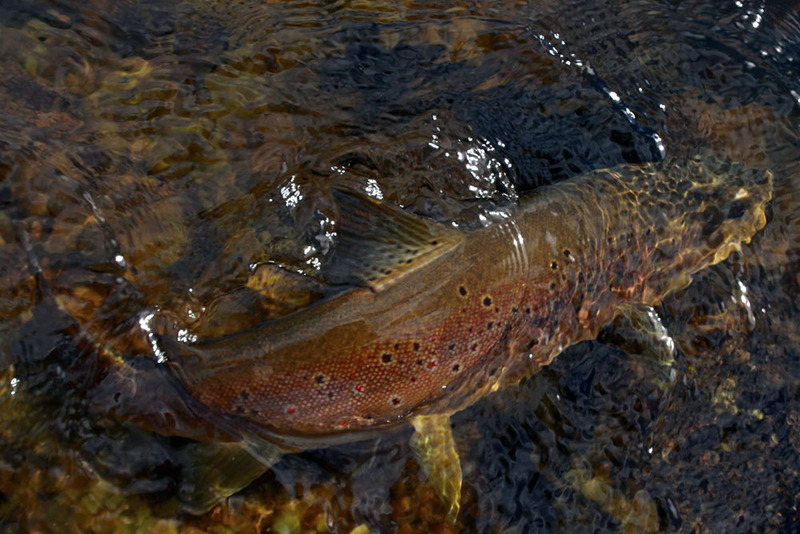 Fish rose to the allpurpose-weapon Chernobyl Ant but also to natural caddis imitations (cdc-caddis) and patterns like Dyret or Superpuppan in the surface film. 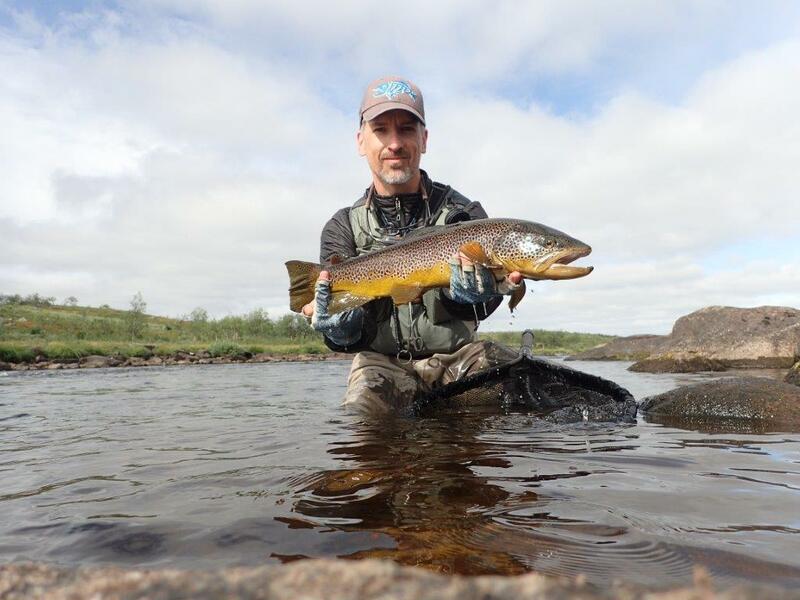 Robin with Browntrout (BT) 2,7 kg. Dead drift seemed to be more seducing than the stimulation by movement of the fly. 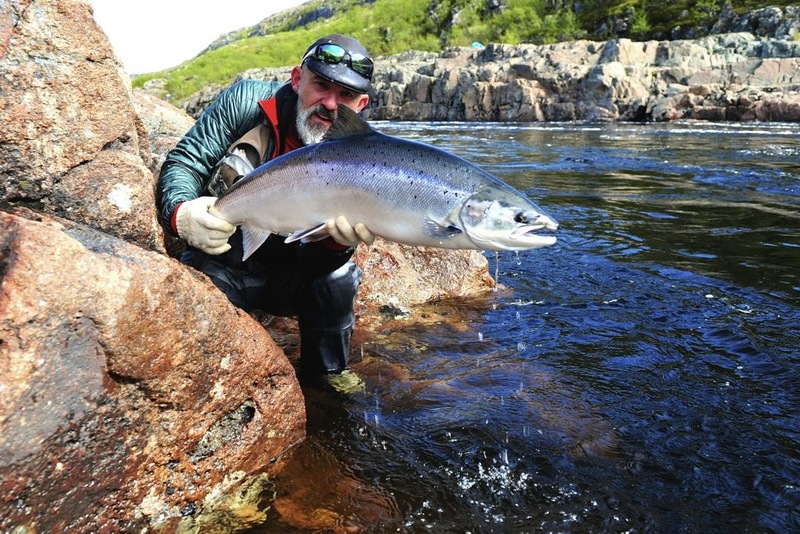 Most of our 55 trouts above 1 kg were caught by dryfly but the experienced guys tried alternative methods (streamer, nymphing) with satisfying success. 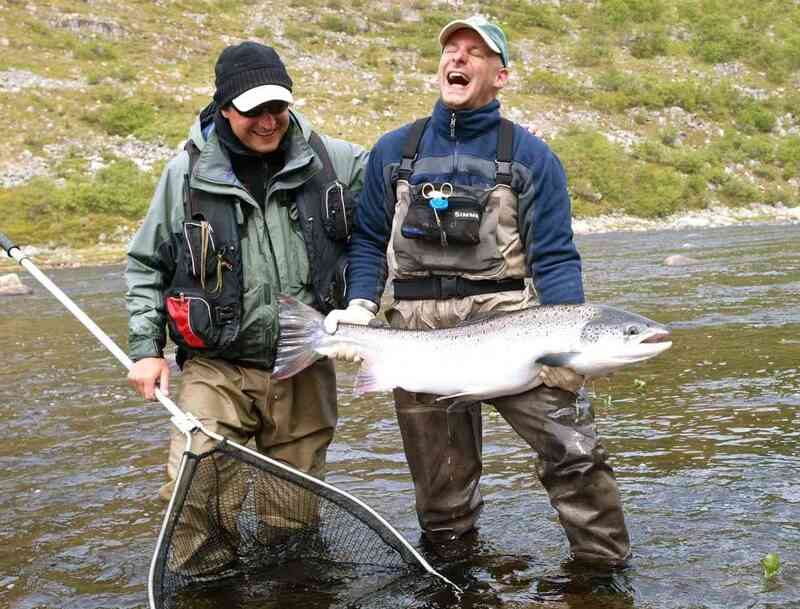 Finally the biggest fish had 3 kg (2x) and additionally many between 2 and 3 kg. 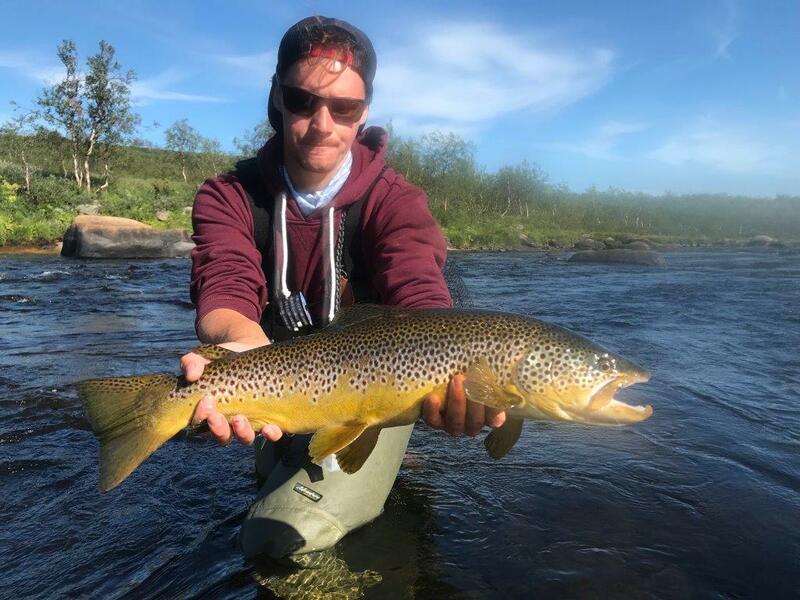 Browntrout-PB achieved three of the group. 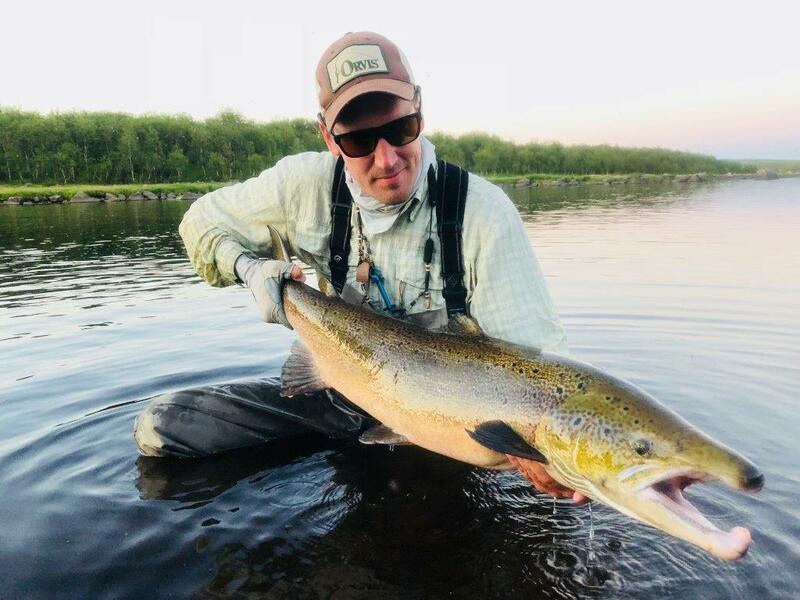 Sascha with Browntrout (BT) 2,7 kg, PB. 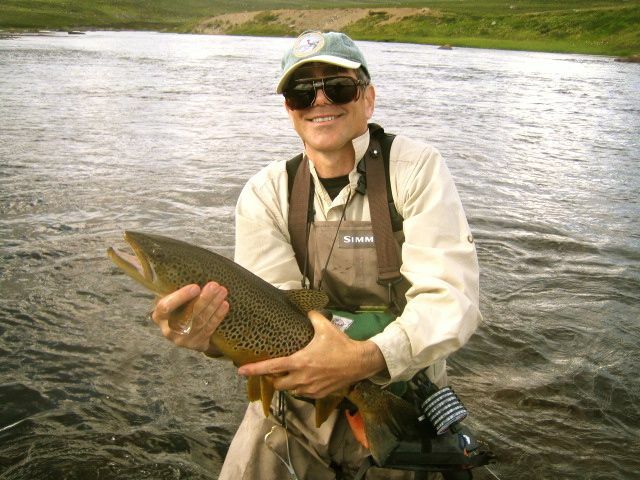 Kevin with Browntrout (BT) 2,3 kg. 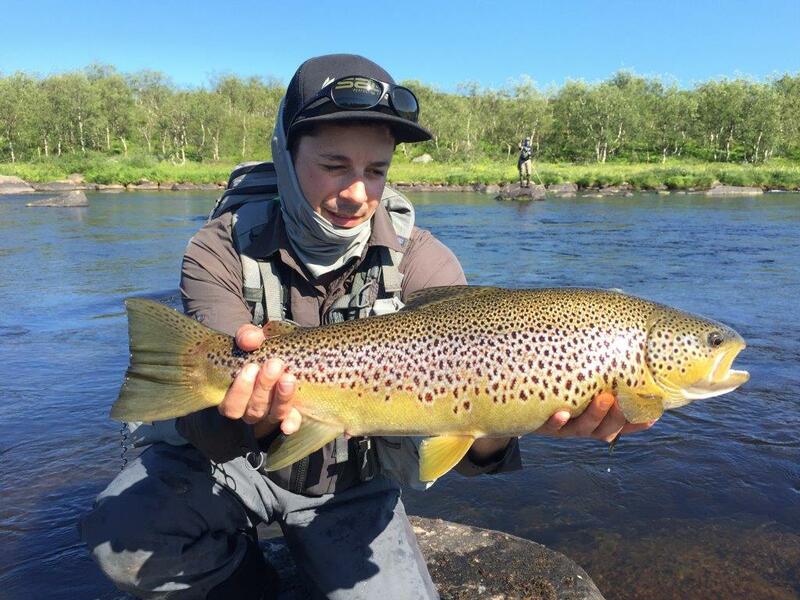 Joel with Browntrout (BT) 2,2 kg, PB. 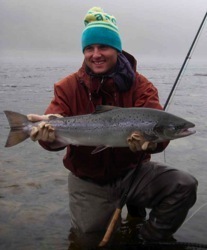 Christoph with Browntrout (BT) 3 kg. 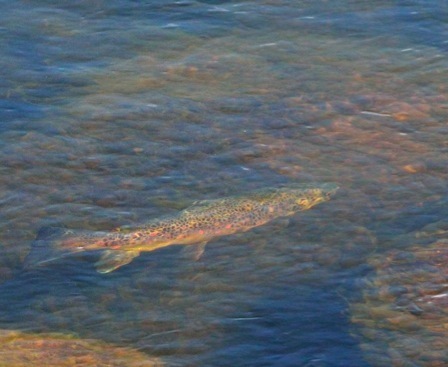 The Chernobyl Ant was attacked by starved pike as well as by aggressive salmons. Therefore it was small wonder that all of us had contact with big fish. 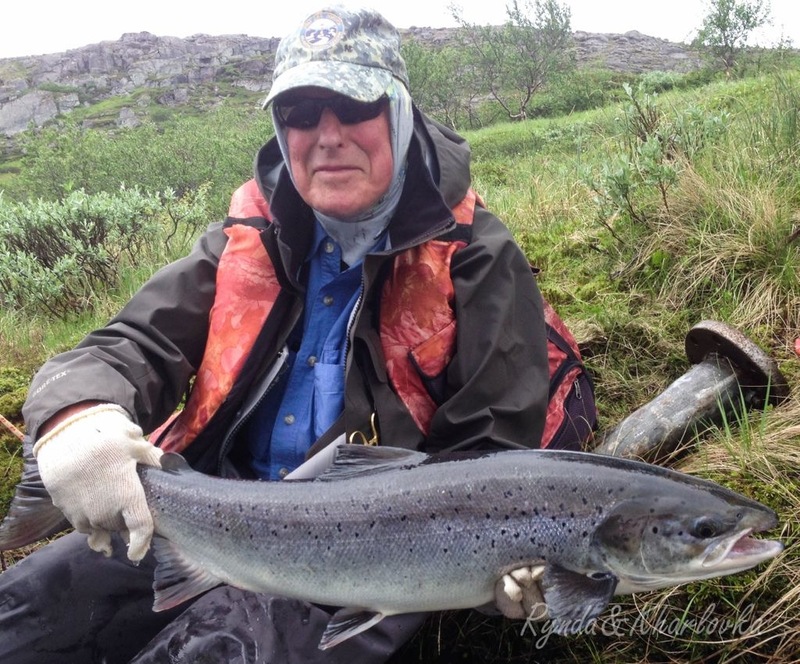 The unequal battle usually was finished by smashed tippet, straightened hook-bends or simply because of the inability to land the king of salmonids with the undersized net. 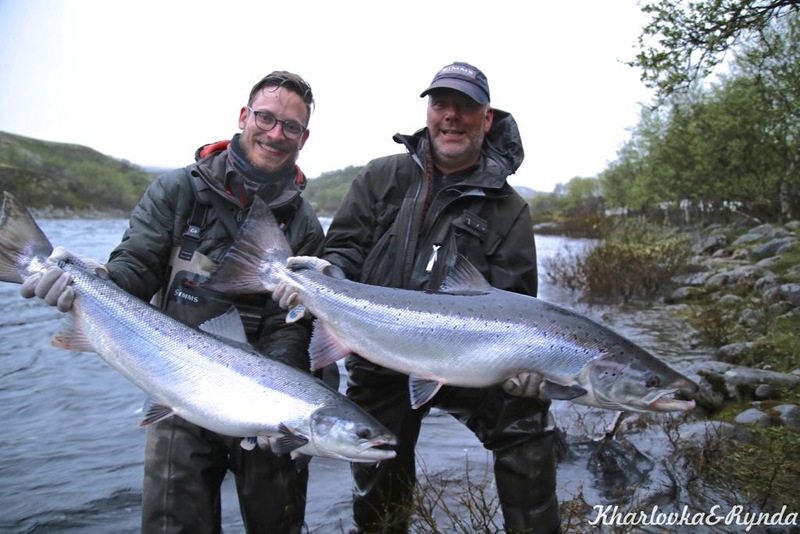 But already in the first day`s evening session Benjamin defeated a 7kg salmon in the first big pool upstream homepool Oset (between the two rocks ). 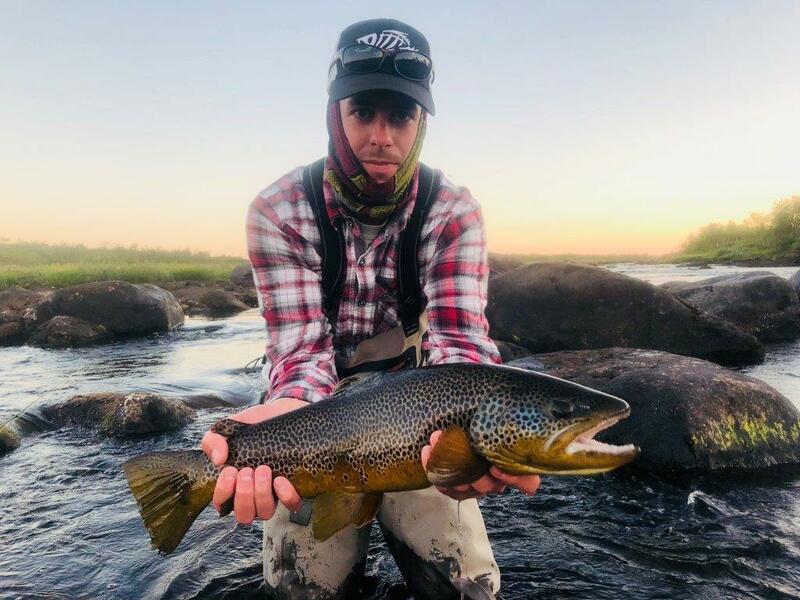 It was an epic fight with his troutfishing setup (0,22 tippet) but finally happy end and a liberating scream of triumph broke through the tundra silence. 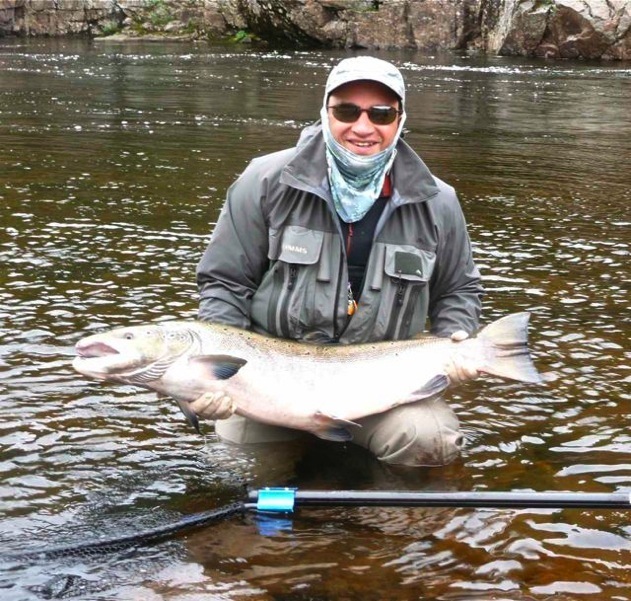 Benjamin with Salmon (7,5kg and 90 cm). 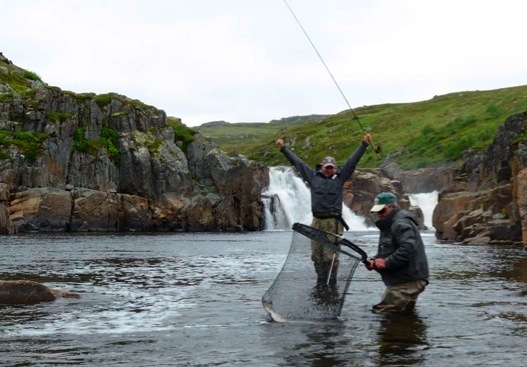 A feeling of a “tundra cinema” presenting a flyfishing film festival was created when Joel got in fight with an even bigger fish at the same spot only 10 minutes later. 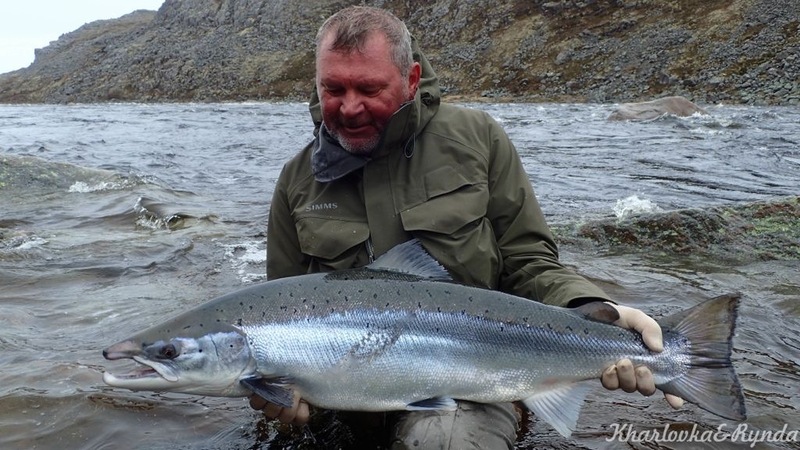 In front of the whole group of enthusiastic fishermen he landed and released a male salmon of 9,5kg (8 weight rod and 0,30 tippet), which obviously had been in the freshwater already a longer period of time. 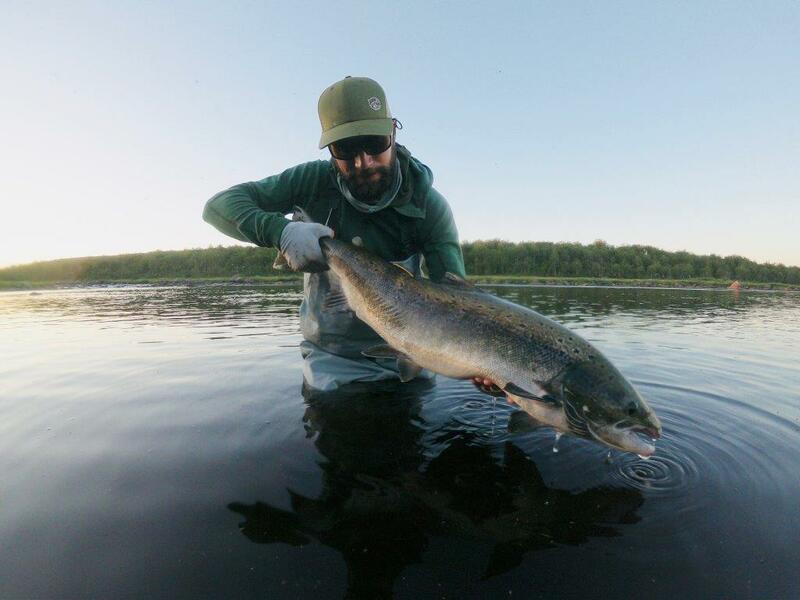 Joel with Salmon (9,5kg and 102 cm). 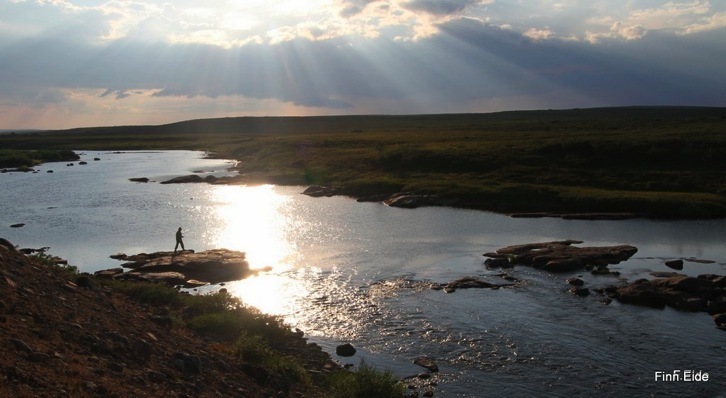 The intense sessions of fishing only were disrupted by the delicious tundra meals (I think Igor never got back a pot without being wiped out completely to get even the tiniest splash of sauce), short breaks for sleeping until the tent was broodingly hot and the tremendous marches through the endless seeming tundra. With withered throat and the tongue sticking to the palate it was an explosion of aroma to taste the numerous northberries (Rubus chamaemorus) and blueberries which where glittering in the sunlight like little jewels along our hiking trail. Despite the demanding circumstances we all have been happy to live the tundra dream. Once more the perfect service of the hosting ASR team was amazing (p.e.midweek helicopter flight to restore the water supply). Last but not least this report would be incomplete without our honest thanks to pukka destinations / Carsten Dogs. His perfect background organization and his authentic advices concerning each detail of his trip portfolio framed the great overall-experience. Now the ambassadors of Wallis are returning to their crystal clear alpine creeks and deep mountain lakes infected with the addiction to the tundra feeling. Kola`s treasures will always stay in their minds. Hope to see you again guys!